Rohingya refugees fleeing to Bangladesh urgently require medical and humanitarian assistance, as an already dire humanitarian situation along the border with Myanmar worsens. Since the 25 August over 688,000 Rohingya refugees have crossed into Bangladesh to flee violence in Rakhine state, Myanmar. This represents one of the largest influxes of Rohingyas into Bangladesh since violence erupted in October 2016. MSF teams have already expanded activities in response to the influx of refugees last October, but this new influx has pushed all actors to the limit. Every day new arrivals are coming into severely congested makeshift camps where refugees are in urgent need of food and clean drinking water. 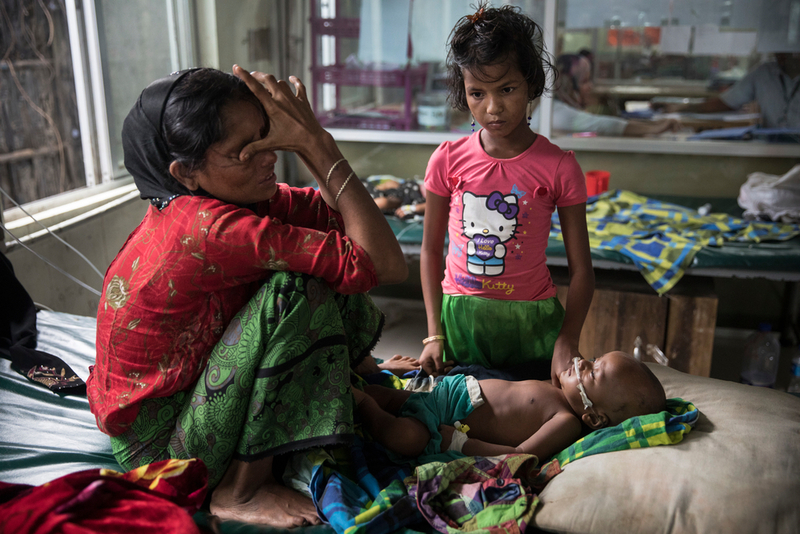 The reception of new arrivals remains chaotic and a massive scale-up of humanitarian aid in Bangladesh is needed to avoid a massive public health disaster. "The military came to our part of town around 6pm and said: ‘Leave the village before 8am tomorrow. Every one that stays will be killed.’"
Many of those arriving are presenting with serious medical needs, such as violence-related injuries, severely infected wounds and advanced obstetric complications. But conditions in the existing makeshift settlements and camps put people at great risk. With vaccination levels low, there is a danger that infections may spread. Much work is also needed to tackle malnutrition among the Rohingyas already in Bangladesh, as well as those remaining in Rakhine state where we estimate a further 150,000 Rohingya remain. A MSF staff member attends to a woman with an acute respiratory infection in the emergency room of MSF's medical facility in Kutupalong. Between 25 August and early December, more than 142,980 patients have been treated at Médecins Sans Frontières (MSF) facilities. We have substantially expanded our operations and capacity to respond to the increase in population. 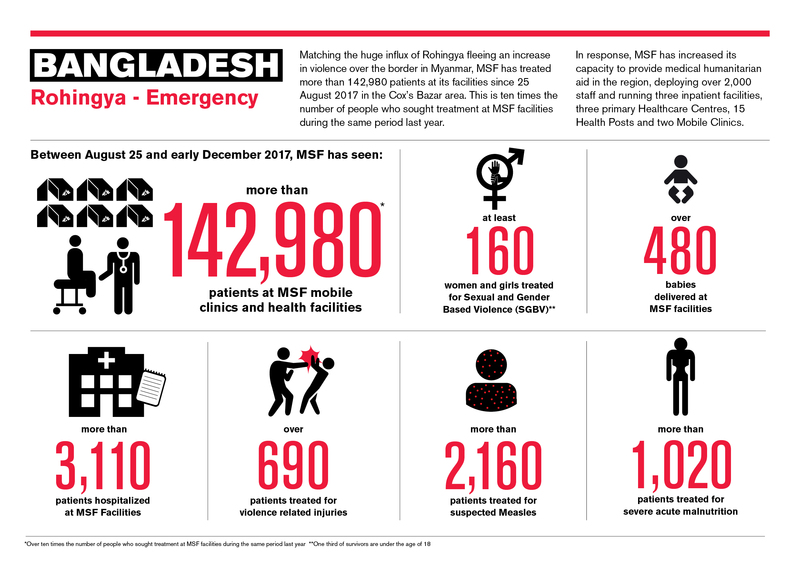 MSF has set up 15 health posts and two mobile clinics to help address the primary health care needs of the population. We have brought in additional nurses, midwives and doctors to provide humanitarian assistance and medical care to some of the hundreds of thousands of people fleeing horrendous violence in Myanmar. MSF has hired an additional 800 staff, on top of around 200 who were already around Cox's Bazar. "We've not had something on this scale here in many years. People that are arriving are traumatized and have no access to medical care. Many of the arrivals have serious medical needs. Without a scale-up of humanitarian support, the health risks are extremely concerning"
MSF has set up additional inpatient wards while also supporting the increase in referrals to other hospitals. MSF is also supplying mobile medical care, providing round-the-clock ambulances as well as dispatching two new mobile medical teams to assess medical needs and treat the injured. However, medical facilities, including MSF’s own clinics, are completely overwhelmed. Between 25 August and 17 September, MSF clinics received a total of 9,602 outpatients, 3,344 emergency room patients, 427 inpatients, 225 patients with violence-related injuries, and 23 cases of sexual violence. Halima Khatu cries about her 8-month-old son Mohammed Harez, who is suffering from acute pneumonia. There is a very high risk of an infectious disease outbreak in the area given the huge and rapid increase in the population, as well as the known low vaccination coverage among the Rohingya community in Myanmar. There are a significant amount of children with complicated measles cases. In the second week of November alone MSF departments admitted up to 20 severe patients per day. MSF is supporting the government in expanding routine vaccination in the camps by initiating vaccinations for children and pregnant women at our facilities. The MoH has begun a measles mop-up campaign on November 18th with the aim of vaccinating 270,800 children between the ages of 6 months and 15 years. MSF will be supporting this campaign with community mobilization, site identification, logistics, and transportation of vaccines. 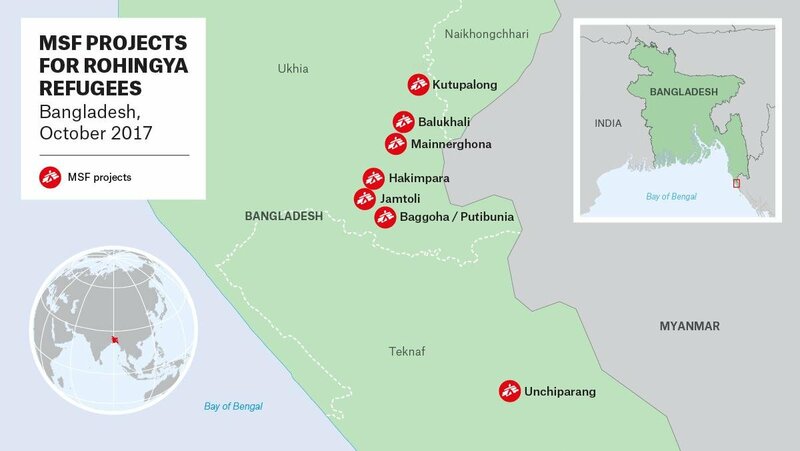 MSF has increased capacity at its Kutupalong medical facility, including new wards and an isolation facility to rapidly contain any suspected or identified cholera or measles cases. 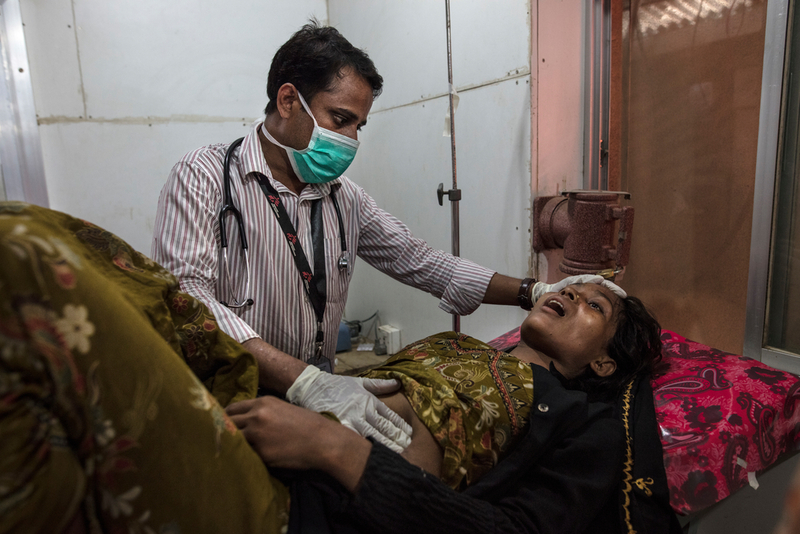 MSF needs your help to continue to provide medical care to Rohingya refugees in Bangladesh. "The situation in the camps is so incredibly fragile, especially with regard to shelter, food and water and sanitation, that one small event could lead to an outbreak that may be the tipping point between a crisis and a catastrophe."